Now that you’ve been teased all week long, it’s almost time for you to shop for your favorite Brand Spankin’ New products from My Favorite Things. But first we’re focusing on our new Die-namics! On my first card, I used the die strip just the way it is presented, layered with pink and white squares inserted into the open spaces. On my second card I simply used the frame strips. 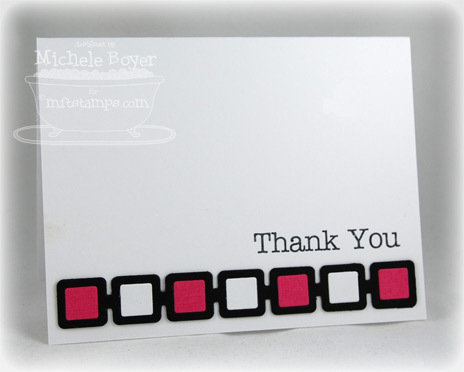 Here I used the negative space from the solid die, placing alternating dark and light pink squares in the open spaces. And here I did a little clipping/inserting with more open frames. You can attend the New Release Party tonight (August 7) from 8-10 p.m. EST HERE in the MFT forum. There is sure to be lots of chatter, games and PRIZES! 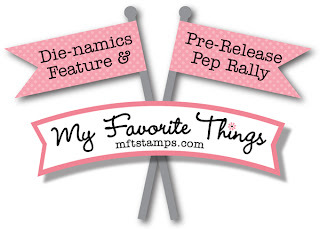 The MFT release, including all new stamp sets and Die-namics, is tonight at 10 p.m. EST. You’ll find all the newest products HERE at release time. You have just a bit more time to submit your entry for this month’s guest designer contest. Check out the forum for details on how YOU can win $200 in stamp sets and Die-namics, and play along with the MFT Design Team for a month. 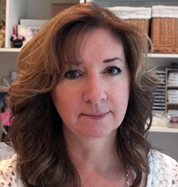 If you’d like to see all the designers’ posts for today, please click on over to the MFT Blog. Be sure to leave comments as you go for the chance to win one of two $10 gift certificates given away daily. The winners will be posted on tonight just before the release party on the MFT blog. I’ll be back tonight for our New Product Tour! Thanks for visiting! Stamps: MFT “Big Greetings” Ink: Memento Tuxedo Black Paper: MFT Black Licorice, Bubblegum, Razzleberry and Sweet Tooth cardstock Accessories: Retro Squares Die-namics. Finished size 5 1/2″ x 4 1/4″. so awesome! 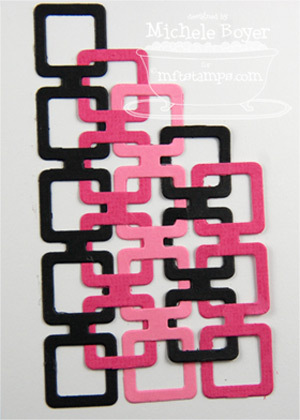 i LOVE these and the cool cardstock colors you used!! thanks for the quick tutorial on chaining the squares too! i’m so going to whip up a bunch of these- totally FAB! awesome, Michele, thanks for the inspiration! I liked the retro die before, but your work has made it a must have! Oh Wow, those retro squares are fabulous! Gorgeous set! I love all the different ways you used the retro squares. I have been loving this die all week and you just sold it to me! Awesome cards! Love them! Oh my goodness…love this creative look with the retro die…amazing ..tfs ! Love these – clean and graphic! So cool! I especially love the outlines layered! Oh my, these are amazing cards Michele!! I love what you have done with the retro squares! What a great set of thank you notes. they would make a great gift. 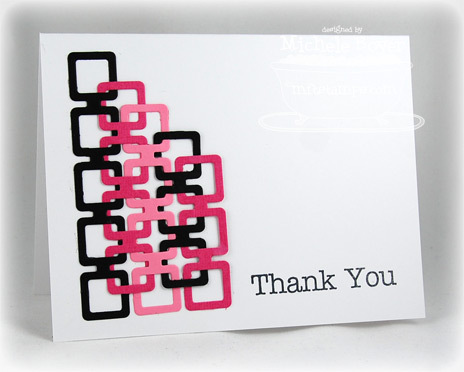 LOVE this great card set… my fav is the interlocking one . Fabulous looking forward to next month this is a must on the list..
Love the interlocking on this you created. WOW!! 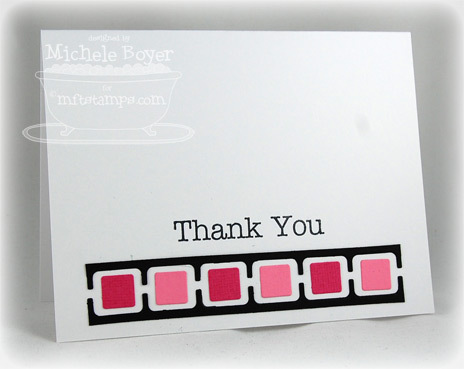 I LOVE the linked retro squares….such a GREAT idea!!! Love the way you used the retro square die. Great idea. Wow!!!!!!!!! These are gorgeous!!! Love the CAS look. Your last one, Oh my!!! That’s amazing how you linked them through one another!!! Cute cards! love the retro style of them! I love these, love the simple design and the way you linked them!! Love how you used the Retro Squares, and your colors really pop! Wow! Wow! Love how you used the retra squares…it’s so much fun!! I just love the cards! So simple and easy to make in mass quantities. 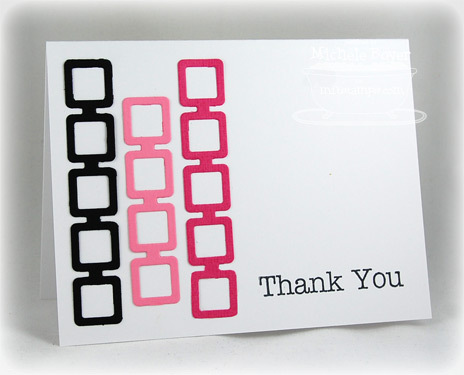 Michele, LOVE all the cards,especially the one with the interlocking squares! too cool! love all of them! the interlocking one is genius! Retro FABULOUSNESS! LOVE this fun set!